I am fairly convinced that this is Fisherman Heaven. Every morning the fisherman gets up, grabs his gear, and heads to the river where millions of fish are clamoring to get upstream. These fish are nice-sized, nine to twelve pounds, and give you a fight to remember. On the other hand, this may be Fisherman Hell. You can only keep three. If you hook them anywhere but the mouth, you have to let them go. This is particularly difficult if this is the largest fish you have ever caught. You may catch three in under an hour, and then you have to leave so someone else can have your spot. I think that most qualifies it for the category. No fisherman I’ve ever met wants to leave a sweet spot knowing the fish are right there ready to be caught. Another oxymoronic aspect of this once-a-year fishing bonanza is the collaborative competition going on. 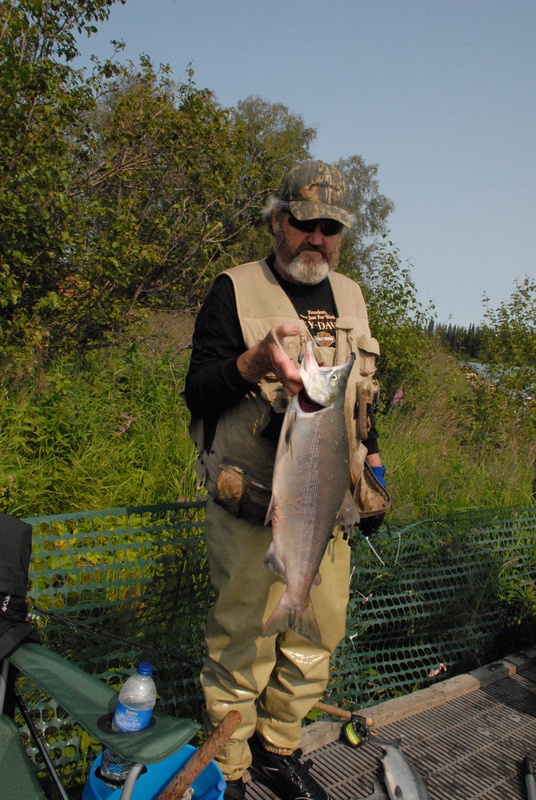 One man said it was “combat fishing.” He was referring to the closeness of the fishermen lining the banks, all vying for that space where the most red salmon are coming through, and the aggravation of tangled lines and lost fish because of the proximity problem. 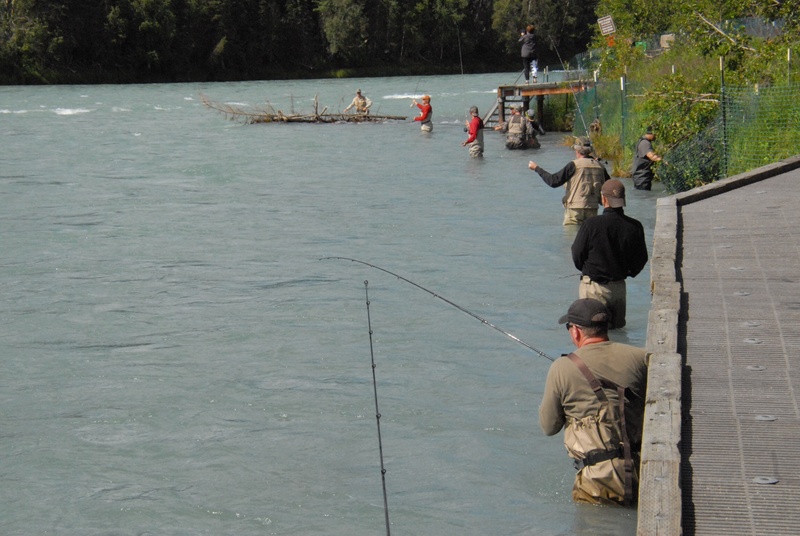 Yes, there are many people lining the river’s edge in chest waders (hip waders sort of defeat the purpose as you are up to your waist in water) wearing fishing vests containing various needed items should you break a line, and carrying the all-important specially-rigged rod and reel combo and dip net. Looks like they are geared for combat. 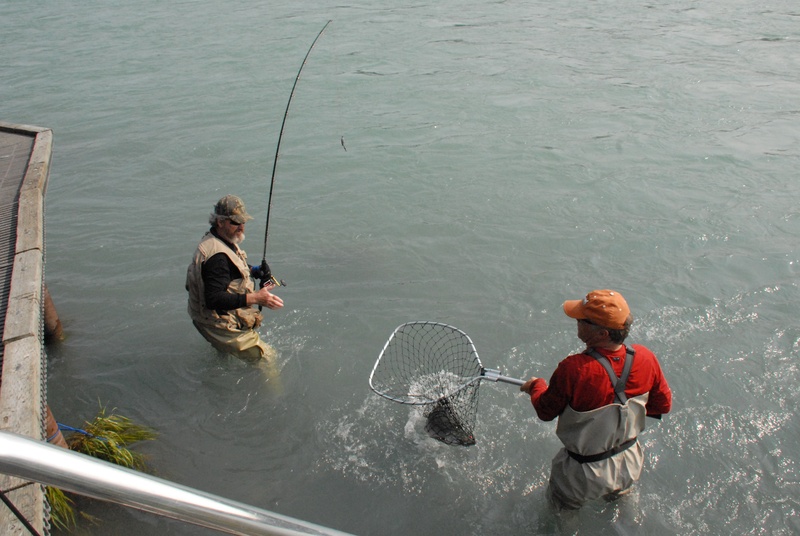 On the other hand, in spite of the fierceness of the competition, one man will hand off his rod and reel, pick up a dip net and help his competitor land his fish. How refreshing! Thank-you and congratulations exchanged, collaboration is over, lines are drawn again, and the battle is renewed. So, if you are bipolar, this will be a piece of cake for you. If not, you may feel a series of mood swings you have never experienced before, should you attempt this adventure.